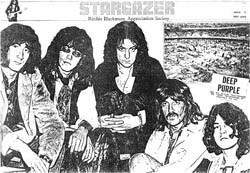 Issue Eleven consisted of twelve photocopied pages (still rattled off on a typewriter then laid out with pics and reduced to size) plus one glossy print of Blackmore (sadly not available for the reprint). The live Rainbow album was just out and we were all fed up with the shortness of it - some fifty minutes spread over a double album. I remember John Peel playing a cut on his show and commenting with heavy sarcasm "well, there's proof that the vinyl shortage is now over..." (there had been a restriction on oil supplies from OPEC pushing the price of raw materials up, so labels had been pressing ever thinner albums in smaller runs). Things were beginning to hot up on the solo scene, with Coverdale's second album previewed, Gillan hitting the road and the appearance of Purple's second archive offering 'Last Concert..' for which we grudgingly gave just two stars! Reading the magazine back it amazes me how hard we were on just about everything... I did one of my first interviews too, with Mick Underwood. His band Strapps were touring with IGB. It sometimes seems wrong interviewing people like him and just wanting to bang on about the Blackmore session days, but he took it in good spirit. He probably wouldn't speak to me these days. Gillan had promised an interview (this was during his 77 UK tour) but his voice had totally gone and Mick agreed to chat for an hour until Ian reappeared to offer him a lift in his Rolls. We also previewed our first t-shirt design, which was the Blackmore App. Soc. logo. These were done for the princely sum of £2.00. I still occasionally see people in these - I couldn't get into mine now if I tried. I stopped wearing it when some wag on a Manchester bus asked me why I had my picture on a t-shirt.... Issue 11 was also the last time the Ritchie Blackmore Appreciation Society title appeared on the cover. Or ‘Live In Japan’,’Chase The Rainbow’,’Recorded Live’, and ‘Rising Sun’ to name some of the various titles it has had! This is a double album but you’ll be lucky if your clock reads anything over 50 minutes. ‘Kill The King’ is the best track , it has rarely sounded better. After it, nothing works quite as well, though Ritchie’s solo in ‘Mistreated’ is simply one of the best he’s done on record. Pure feeling and experimentation, it’s bloody lovely. Overall it’s better than the first album, more balanced. Ian’s voice should be far more to the fore. I like the title track best of all, quite a good time change in there, and a nice guitar solo. I like the introduction to ‘Angel Manchenio’, it almost has a ‘Soldier Of Fortune’ feel about it. Lyrics good, as they are throughout the album. As soon as Gillan began to sing it was clear that he was going to have a hard time. He took to the screaming in ‘Child In Time’ like he’d never been away, but hidden by his hair, his hand was clutching at his throat. The group were good, though they seemed to be playing for themselves and not the audience. ‘Smoke..’ was played through a wah-wah pedal! It’s about time somebody took the piss out of it. His voice incapable of much subtlety, Gillan took to screaming the last verse. Must have been agony, but it sounded great. Thanks to Oyster Records for the preview tape. It’s basically a long instumental work split over the two sides, with a vocal intro and outro, which for me are the most successful parts of the whole thing. The problem is that they’re so strong compared to the parts in between, which just seem like meandering backing tracks. After I’d done a review of the ‘Get It While It Tastes’ bootleg from the same 15th December 1975 Tokyo concert, this arrived from Japan. Stripped of the bootleg’s atmosphere the music has very little to offer. There is always something missing in the sound – it’s like listening to an LP with one of the tracks mixed off. ‘Sunny Days’ was written about the last Deep Purple tour of America, ‘Lady’ and ‘Time On My Side’ were for the Purple album after Come Taste, but were obviously not used. A shame, as they lack the strength here that the Purple team could have endowed them with. Coverdale reckons the solo in ‘Whitesnake’ will “give Blackmore a run for his money.” Sorry to disagree David…. Right, what have we got then? Seven numbers so far (not counting an alternative version of one song). ‘Northwinds’ starts the thing off, my second favourite already, better than anything on ‘Whitesnake’. Much of the improvement on this album is due to the fact that it sounds as if the vocals and backings have been done much closer together, and are far more sympathetic to one another. ‘Only My Soul’ is the track as far as I’m concerned. Plenty of musical variety and dynamics. End a live act with that and you’ll slay ‘em lad! Have put down all the backing tracks for the second LP. The vocals will be finished shortly. It will feature versions of ‘Steamroller Blues’and ‘The Ballad of Mr.Giver’, both done well on stage. Burr Bailey single review (1960s Blackmore session)....Ian Gillan's 1974 solo album review...and more..